The eighties were an exciting time to be growing up here in Australia. The music was fantastic, the country was riding high on the sheep's back (seriously, the price of wool was astronomical), and all was well with the world. We'd even just robbed the yanks of the coveted Americas cup. At the time, the Australian cycling industry was going gangbusters. We had a veritable plethora of local bike brands; from the cheap and cheerful Repco and Cyclops, through Apollo, Speedwell, Bennett, and Malvern Star. The custom and small-batch market was well catered to as well, with Abeni, Bundy, Graecross, Ricardo, Super Elliott to name just the big ones. Enter a fledgeling plastic molding business in Melbourne, Rosebank plastics. They were in business making all manner of plastic injection molded products for other companies; buckets, automotive products etc., and the founders were looking for a product that they could both make and market themselves. 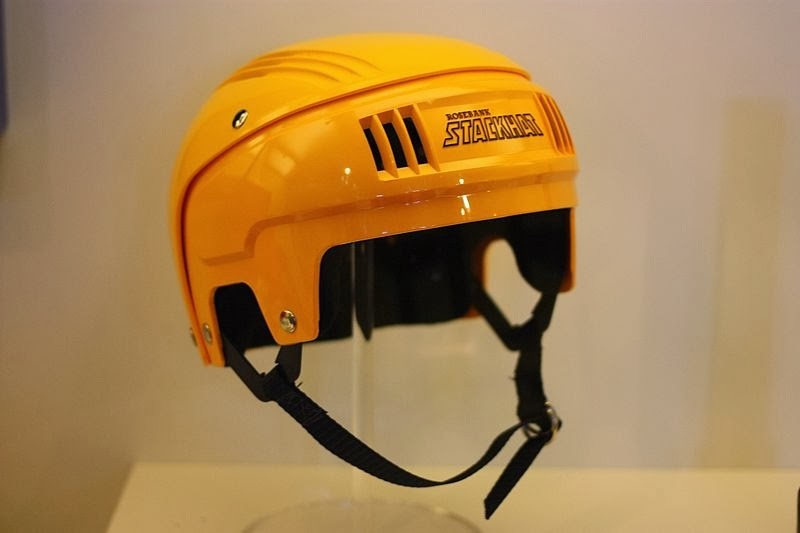 Commonwealth Industrial Gases (CIG) had toyed with the idea of a "sports helmet" for cricketers, skateboarders, horse riders and bike riders, but the molds were unfinished - CIG didn't have much interest in the product. Rosebank saw the opportunity and bought the molds, coming up with the Stackhat helmet. Importantly, the Stackhat wasn't developed by cyclists. It was developed by a maker of industrial gas and workshop safety gear. CIG's main products (apart from gas bottles) were and are welding gear, facemasks, dust masks and the like. They incorporated some token "cooling slots" in the mold, but nothing substantial. What was substantial was the weight. These puppies had a thick ABS shell, an inch or so of dense polystyrene, and an inner cloth liner. You could bounce one on a concrete floor all day long without fear of damaging it. Rosebank marketed their new helmet enthusiastically. Before long, they were on the shelves in many bike shops and department stores across the country. Non-cycling parents loved them for much the same reason the non-cyclist designers did. They could take all the abuse a kid could possibly dish out and come back begging for more. They were also relatively inexpensive. There was just one teensy problem. Us kids really hated them. And with good reason. Most of Australia gets pretty hot in summer, and trying to exercise with a kilogram of esky strapped to your head is, well, not a lot of fun. So we tended to forget our Stackhats, or else lose them. Indeed pretty soon the Stackhat become the shining emblem of the dorky kid who always did exactly as he was told by his parents. Not only were they seriously awful to wear, but being seen in one was tantamount to social suicide. Not that all us kids were totally against helmets. 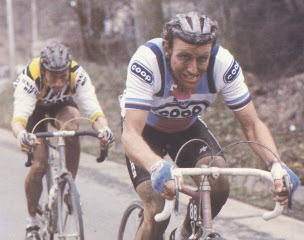 I really wanted a proper Rogelli or Cinelli one, so I could pretend I was Hinault or Zoetemelk, and my ride to school was Liege-Bastogne-Liege. But then I was a pretty weird kid. Now that I think of it I'm a weird adult, too. Along about the same time, there was a new and exciting movement in cycling, specifically targeting us layabout youths. BMX. I myself never got into BMX (I confess it wasn't nearly Italian enough for me), but all of my friends had one. Every single one. I had to search in the bike shed at school through bloody Kuwaharas and Redlines six deep to find my trusty Peugeot. The BMX movement brought with it a certain disdain for authority, exemplified by Nicole Kidman's only half-way decent performance in BMX bandits. Frankly, we ran amok. So they kept trying to force these helmets on us, and we kept ignoring them. Soon enough, they started getting in the politician's ears. Rosebank were particularly insidious. Not only did they go to work on the Victorian government, they also got in the ear of Standards Australia, making sure that the new Australian Standard for bicycle helmets, which was being developed ahead of compulsory helmet legislation, would favour them over other manufacturers. Key to this was the "resistance to penetration" test, which the lightweight well ventilated fabric covered polystyrene helmets of the time failed, but of course the Stackhat passed. Note of course there was no maximum weight test, nor ventilation test. The standards, like the helmets, were developed by a committee of bureaucrats, not cyclists. Even the bike shops were complicit. They did the maths. Five million cyclists times $80 per helmet equals a hell of a lot of profit. Standards Australia had done a very good job of stitching the market up, so there was zero overseas competition. Even though there were perfectly good overseas standards that could be used, like Snell and BSA, these weren't going to be allowed on our precious Australian heads. Markups could be stratospheric, and they were and still are. So '89 comes, and the helmet laws start coming into effect. For many of the adult cyclists this wasn't such a problem. A lot of them already wore helmets (after all the marketing campaigns of the last ten years were all aimed squarely at them) and didn't see it as such a problem. They also had the money to get themselves half-way decent ones. For us teenagers though it was devastating. There was simply no way we were going to stick a bucket on our heads to go to school. Even if we did, what the hell were we going to do with the damn thing when we got there? Making matters worse, it was all-but-impossible to convince mum of the utility of any helmet beyond the POS Stackhat, as she simply had no idea. To add insult to injury, the police went to town, creating cycling units to patrol the local shops and handing out $40 fines left, right and center. I sometimes wonder what was in the minds of the politicians of the time who voted in those laws. Was it truly a misguided effort to protect us, or was there some element of wanting to get rid of the kids down the local shops, playing video games and riding too fast on their BMX bikes? Sure enough most of us stopped riding. The bureaucrats declared victory, as the percentage of helmet wearing cyclists doubled overnight. What they conveniently forgot to mention was that the actual number of cyclists (especially teenaged cyclists) halved. Good one. All the bike shops did terribly well for a couple of years, and then many started closing. People spent their first paychecks on cars, not high-end bikes. Most of those Australian bike brands from my childhood are gone now. Sure, most of the blame goes to globalisation and the rise of companies like Giant, but how much blame goes to our rather peculiar helmet laws? Other comparable countries (I'm thinking the US) had a bike boom that started in the late eighties, with Bontrager, Klein, Cannondale, Trek, etc. becoming huge. Australia, not so much. Even the Kiwis have Avanti. Ironically the bike boom of the nineties that created all those new US manufacturers was mountain bikes. Oversized BMX bikes with gears for cashed up twenty-somethings. My enduring memory of Rosebank's Stackhat is from 1986. I was a mad keen road cyclist, riding my crappy Avanti water-pipe roadie sans-helmet on the great Victorian bike ride, somewhere around Sale. It was bloody hot, and the day was long. I came across a younger kid who was being bundled into the back of an ambulance. Word going round was that she'd fainted and fallen off her bike, suffering heat exhaustion. Sitting on the ground next to her bike was her helmet, a Stackhat. Excellent article Suzi. The reason that Victoria introduced a helmet wearing law was due to a federal government 'bribe' of $20 million to improve black spot funding. During the final period of the Hawke government, Hawke had become hostage to a number of small, unrepresentative pressure groups such as the Royal Australasian College of surgeons. Two of their members - Gordon Trinca and Frank McDermott - pressured the govt to introduce the law. The problem was they didn't understand issues such as risk compensation and the basic psychology of people not wanting to wear helmets. The Victorian government didn't even do a cost/benefit analysis as requires under the Subordinate Legislation Act (in theory this nullifies the law). Further, no ongoing research program was ever commissioned by the Federal government despite the law. Virtually every research report that's been commissioned has been ignored by governments despite the fact that this country should have the most advanced helmets in the world, so most of the lids we now get are inferior to what they should be. But will governments repeal the law? What - when the Vic government makes $1 million from fines every year???? Think you are living in a democracy when extortion is legal?